Mental Health Monday: Holiday Culture Clash? Joyful Anticipation? As you can see, this post is a day late (again) since some of my kids and grands were still here through the day on Monday. So, this is the next in my series on holiday traditions—family, spiritual, secular, or whatever. Here goes. It’s confusing living in America in the weeks leading up to Christmas. Well, only if your faith traditions run counter to the secular celebration that begins the day after Thanksgiving. In both the Anglican and the Orthodox Christian traditions, the weeks leading up to Christmas are meant to be times of preparation for the celebration that runs from Christmas Day to Epiphany (the 12 Days of Christmas). For Orthodox Christians the season of preparation begins on November 15. We call this season the Nativity Fast. And yes, there is fasting from meat, fish, dairy, wine and oil for most of those days leading up to the Feast of the Nativity. It’s not really complicated, so why is it confusing? Because Orthodoxy isn’t native to this country. Our faith didn’t show up here until around 1794, and that was in Alaska. And even though Orthodoxy has grown over the decades, our traditions are still only observed by a very small minority. So, while we are FASTING, most of our friends and neighbors are already FEASTING with pre-Christmas parties (I’m actually hosting two of these before Christmas), cookie-swaps (I’m going to one this Saturday), and decorating houses with trees and lights. It’s hard to participate in our community’s calendar of celebration and keep the Orthodox fast and attitude of preparation. For many years I struggled with this. I felt sad missing out on the joyful times I saw my friends and neighbors enjoying. I tried to fast and prepare to welcome the birth of Christ in my heart anew, but there was always a bit of a cloud because of the culture clash. This season I’ve pretty much abandoned the fast and I’m being more moderate about the somber time of preparation. I’m even hosting two Christmas parties BEFORE December 25. One is for a group of Memphis Grizzlies fans who like to gather and watch the “away” games together. The other is an “after party” for my neighbors who live with us around “Christmas Tree Park,” which will be lit with lights this coming Sunday night. I’m trying to join in the festive spirit of the community without completely abandoning my spiritual preparation for Nativity. I haven’t been to church in about two weeks, so last night—after dropping the last of my kids and grands at the airport around 5—I went to St. John Orthodox Church to participate in the Paraclesis to the Mother of God, which we pray during the Nativity Fast. As I walked into the church and smelled the incense and heard the chanting, something in my soul clicked. It was good to be there and to join with my Orthodox brethren in singing, “Rejoice, O Bethlehem!… Christ is born… raising the image that fell at the beginning!” I was reminded that anticipation can also be joyful. Afterwards we joined some of the congregation at our pastor’s home for soup and salad and a time of fellowship. 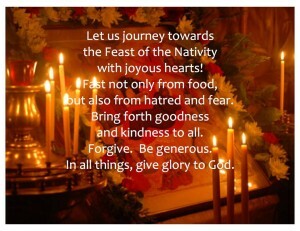 There was some discussion about the “fasting foods” we ate—the soup and desserts were meat and dairy free—but no one seemed saddened by the “rules.” I returned home refreshed and ready to continue the journey to Nativity—accepting the two cultures in which I live and no longer feeling such an emotional tug of war. It’s all good. I think moderation is great. I have to admit I’m pretty terrible at the fasting thing!! I was really gung-ho when we first converted, but moderation seems like the way for me now (let’s throw some Buddhism into the mix, huh?). I like how you are able to blend feasting and fasting, anticipating and celebrating, into your advent season. I love Orthodoxy’s richness but I don’t know that we have to throw away everything in the modern world in order to be Orthodox. I like your outlook! Also, I’ve enjoyed seeing all the pictures of your kids and grandkids here and on FB!! 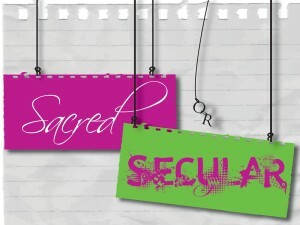 I KNEW you would get this, Karissa:-) Loved your post on “The Advent of Unbelief.” Good stuff. I think sometimes the confusion comes of a deeper yearning–that of wanting to keep traditions alive, while also being mindful of the present moment. Breathing into the Here and Now doesn’t always jibe with a fixed-date set of rituals, leading up to a date-certain Noel. And yet…here we are, celebrating the moment & celebrating the season, together and within our own tribes. Glad I found you & your blog, and I appreciate also the connection to Karissa. It feels good to find myself among those who are talking the same language and exploring the same territory. Thank you for connecting with me on Facebook! Thanks for reading and commenting, Melodye. I very much appreciate your thoughts. Yes. This. More than the hymns or even the icons, the smell of incense is often the only thing that quiets my mind and allows me (for fleeting moments) to focus on something other than the otherwise endless traffic of self-directed thoughts; music masked in aroma, almost. This piece resonates with my current outlook, too (as do Karissa’s comments). Thank you for posting it. Thanks so much, David. I’m surprised that you, as a musician, feel as strongly about the incense as the music! Really, I think it’s everything in combination that calls us from the fray.